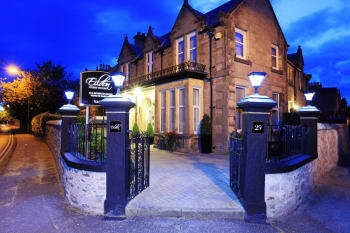 Welcome to Eildon Guest House, fine accommodation in the Heart of the Highland Capital… Inverness. 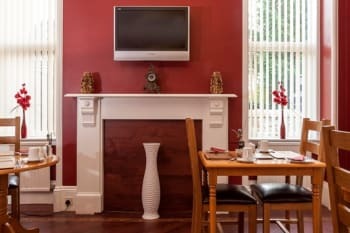 Eildon is a family run Inverness Guest House situated in a quiet residential area of the city and only a few minutes walk from the castle, High street shops, restaurants and all amenities of the Highland capital and only ten minutes walk from the local Golf Club. All rooms are en-suite with Beverage tray, silent mini fridge, Free WiFi, Flat screen TV with DVD player. We are walking distance from the town centre and free off road parking is available. There are no rooms available at Eildon Guest House for these dates. Children: Children aged 10 or over are welcome. Our one night stay was too short. This guesthouse is spotless. The decor is lovely and the hostess is warm and welcoming. The bathroom was so very nice. Lots of hot water, good lighting, plenty of space and soft, fluffy towels. Highly recommend! Oh and easy walking distance to town center. Eildon Guest House is an excellent B & B, well located in Inverness. It is owned by Jacqueline and is extremely well run. Jacqueline couldn’t be more friendly and is so helpful. She is a great information source and has tremendous lunch and dinner recommendations. Breakfast is served and is always hot and delicious. Our room was immaculate and our bathroom was updated and very nice. We highly recommend this Bed & Breakfast to anyone visiting Inverness. It was charming! Very friendly welcome in this superb guesthouse with everything you could possibly need for a great stay. Room was very comfortable and extremely clean. Ensuite was a great size, roomy and shower nice and hot. Breakfast choice was lovely with plenty on offer. Would highly recommend and will definitely stay again. This was one of the best experiences of guesthouse bed & breakfast I have ever had ..... considering we were staying one night enroute to somewhere else .... we were treat as though we were long term guests .... wonderful warm welcome .... the rooms & facilities were equal to a five star hotel! Breakfast was far superior to any hotel I’ve stayed in & I would highly recommend it to anyone visiting Inverness! We were able to leave our car at the property & walk into the town easily to eat at The Castle Restaurant. It’s the second time we have stayed at the accommodation and we love the place. Everything is perfect at the faculties. Couldn't have asked for a better stay! A perfect place. Thank you for everything! This is an exceptional B and B. The bedrooms are of the highest quality and the breakfast is outstanding. I have travelled all over the world and this is up there with the very best!! Inverness and the surrounding area is beautiful and lots to do! Good food and bars nearby. The rooms was so clean and the beds were so comfy. Our host Jacqueline greeted us and she is so lovey and friendly. Breakfast was so yummy. Thanks for everything. We thoroughly enjoyed our stay in Inverness. La habitación era grande, con todas las comodidades y con galletitas, té y chocolate caliente. El cuarto de baño era espectacular y enorme. El desayuno era muy variado, con miles de cereales, fruta fresca, yogur, queso, tostadas, bollería, porridge o desayuno escocés. Fue una gran estancia. Muy recomendable. We found the location to be very useful for getting into town both walking and driving. The parking was good but is limited so may have been a problem if there were more guest with cars. The facilities were very good and the breakfast was fantastic. The owner was very welcoming so overall excellent. Being on a one-way street some people may find it a bit harder to locate. However, they shouldn't be put off and just plan ahead. I had an amazing stay at Eildon guest house with my family, everything was perfect with Jacqueline who can answer all of your questions. We would recommend the Black Isle pub on Church Street for their organic beers! Otherwise, we had the best italian food ever in Inverness : the restaurant is called "Zizzi" an is just amazing, we went twice. This enchanting old house has been completely renovated and the rooms are modern and comfortable, there is even a TV in the bathroom! It is located in a quiet residential area but only a short walk to the city center. The best part, however, was the hostess with her charm and friendliness. Welcoming place to stay, well organised, nothing too much trouble. Excellent cooked breakfast. Centrally located in Inverness, easy walking distance to the river, and shops. We were welcomed by Jacqueline who showed us to our lovely, well equipped room with a beautiful en suite kitted out with a mirror/television- how cool is that?! Breakfast was plentiful, well set out and served freshly cooked. Jacqueline was so helpful in recommending places to eat and giving directions. Everything was of a nice quality and was spotless. We would highly recommend the Eildon and look forward to hopefully staying there again. Plenty of shops, restaurants & bars. Jaqueline welcomed us very warmly. She is a great host. The place was spotless and breakfast phenomenal. We highly recommend staying there when in Inverness and will stay there next time ourselves as well. Staff were friendly and helpful. Eildon Guest House is ideally located a short walk to the centre of the city. Walk the river - it's beautiful. Very good and nice stay. Trail round about Loch Ness. Beautiful sceneries and paths to walk. What a lovely stay at this charming guest house. Great location, amenities, breakfast, and most of all a wonderful host in Jacqueline. There to greet us and walk us through, with great recommendations for things to do and places to eat Very memorable stay. Listen to Jacqueline’s dining recommendations! We ate at all three places she recommended and all were great. Very clean and well run. Fantastic breakfast. Ubicado en una hermosa calle, acogedora bienvenida, hotel lleno de detalles. We felt just like we were at home. Just a perfect stay. Observe the information about check in hours, because we forgot about it. We loved our stay at the Eildon House. Our room was great, the food was fantastic and our host was most gracious. The only negative was that the house was a little difficult to find due to the one way streets in the area. Spacious and up to date. Great hosts. Easy location to downtown. There are many places to choose from and I am glad we stayed here. The room was comfortable, clean and recently updated. The bathroom was gorgeous, with every amenity including a television. Breakfast offered many choices plus extra items like cheese and yogurt. The location was conveniently close to Castle Street with many dining choices. I really appreciated that you arranged the taxi and I was able to get to the Cawdor castle. It was lovely castle and worth visiting. Thank you! We had 1 night in Inverness and were lucky enough to have stayed at Eildon Guest House. It was one of the best B&B’s we stayed at during a monthlong tour by car trip in England, Wales and Scotland. The facility, the breakfast, room and amenities were outstanding! Very happy with the B&B, very friendly and beautiful rooms. Beautiful B & B in the heart of Inverness. Such friendly staff made us so welcome. Within walking distance to great pubs and restaurants. Highly recommended! Absolutely!! The accommodations were excellent. Lisa was a very attentive host, eager to help and always with a gracious smile. We would stay here again without question. Very nice and comfortable guest house in a good position to the City. Less than ten minutes to the castel an the pedestrian zone. Breakfast is rich and excellent. Hostess and stuff er very friendly und helpful. The hostess tends to give good advices to good and excellent restaurents. perfect, it's very clean, the host was a great kindness. The breakfast is fabulous, it is rich. 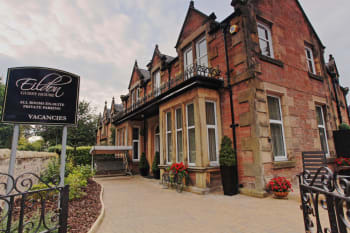 When we come back in Scotland, we will be delighted to return Eildon Guest House. beautiful paths around the river ness, the castle, a good starting point to discover areas. Our stay at Eildon was great! Jacqueline was very friendly, and was kind and accommodating enough to make sure there were cold breakfast items and toast available in the early morning when we had to get up at an ungodly pre-breakfast hour for a tour to Orkney. We were also able to park on the street right outside. Full breakfast the next morning was yummy. Would definitely recommend! We had a great pub dinner at the Castle Tavern, just a 10 min walk away, and also easily walked to the Inverness bus station in the morning for a tour (about a 15 min walk). Top guest house. Spacious room, modern bathroom. Very nice and helpfull landlady. Make reservations for restaurants, especialy on saturday. Jacqueline was very nice and even fixed us breakfast on the day we forgot to leave our order. The location was a quick walk to downtown shopping and restaurants/taverns and parking was easy and convenient. I recommend it with no doubt. It was absolutely lovely! Wish we could have stayed longer. We had a fantastic stay with you. The room was perfect - big, great facilities, en suite was lovely. Everything was spotlessly clean, the decor is lovely too, not too much and just enough to keep us interested. Breakfast was brilliant, hot and plentiful, kept us going until supper time! I require a gluten free diet and this was catered for no problem, unlike some other places I have stayed, where I have nothing much to eat. Location is central, within easy walking distance, lots of help and advice of the best activities and things to see and do. Overall, we will totally recommend Eildon to everyone and we will definitely return. Thank you. The Castle is a great pub, great food and atmosphere. Our room was comfortable and very clean. Our hostess was accommodating when we arrived a bit early before check-in time. Our breakfast each morning was delicious with a variety of options. Lovely B & B! According to Lisa, we had the best room (#4). Very spacious, with a sitting area and modern bathroom. Wonderful dining room and yummy breakfast! Delightful team running the B&B. Very accommodating and helpful. Just in the middle of Inverness. We had a nice family room with large and new bathroom. The breakfast was very good and fresh and the staff very nice, friendly and helpful. Perfect for visiting Inverness. 5 minutes walk to town. A beautiful B&B ideally located in the City. Its charm and beauty is only surpassed by the staff. All major city attractions are a short walk or drive from the B&B. Two very nice dinning options are located within blacks from the B&B. Thank you so much for our wonderful stay. Everything was lovely. Thanks also for providing gluten free items for breakfast. This was the perfect bed and breakfast in the perfect location. Everything was clean and well taken care of. The staff was lovely and always helpful. The breakfast was great and had a lot of options to choose from. I would definitely recommend and stay here again. This is a very nice B&B with excellent rooms, food & host. It is convenient to downtown Inverness & restaurants. Would highly recommend it to anyone travelling to Inverness looking for a B&B. Jacqueline really made us feel welcome. We spent our two nights in Inverness at Eildon Guest House and we would definitely stay there again. We recommend a short walk before supper. The "Islands Walk" is about 2 miles long and close to Eildon...very peaceful and relaxing. (Ask Jacqueline for directions to that and other walks in Inverness.) Follow up your walk with supper at Cafe 1...delicious. Jacqueline is a wonderful host, warm and welcoming. Location is great for walking to restaurants and other attractions. Culloden Battlefield is worth a visit. Wonderful visitors center.We had a lovely dinner at Cafe 1, reservations are advised. Very clean, modern updated bathroom. Wonderful skylight in bathroom. The room even had a mini fridge with a jug of milk and bottle of water. Five minute walk into town. Easy parking behind the building. Very clean, very comfortable, and spacious. Excellent service, and very welcoming! I highly recommend!! Easy walking to several restaurants. Our fave was Castle Restaurant. Excellent fish and chips! A very good location, just a view minutes walking distance from the city center. We did get a specious room and bathroom and very clean. The breakfast was great and Jacqueline is a wonderful hostess. We would definitely stay here again. A very good B & B. Near to good local restaurants. 15 minute walk to towncenter. Taxi back +/- $ 6,=. My stay at the Eildon Guest House was fantastic, Jackie was wonderful! Her Guest House is beautifully maintained and all the details have been considered from a towel warmer in the bathroom to the little bottle of milk for your coffee or tea in the en-suite fridge. She had a wonderful selection of fresh fruits, cereals, yogurts and pastries for those who wanted a cold breakfast as well as a tasty hot breakfast that was served early and quickly. I have to follow a strict gluten free diet and Jackie was kind enough to go out of her way to provide me with some delicious gluten free bread for breakfast and a gluten free treat for tea. The Eildon is within easy walking distance from downtown but is far enough out that you don't get mixed into the shuffle and noise. Jackie was very friendly and a great resource. She helped guide us to restaurants, things to do in town and laundry services. I would highly recommend staying at the Eildon Guest House and I look forward to returning here in the future! The WOW Scotland bus tour to Isle of Skye was great, highly recommend this tour company. The Castle Tavern by Inverness Castle had good food at a great price and can accommodate gluten free needs. Public transit to the Black Isle was inexpensive and a fun ride on a double decker bus. Culloden battlefield visitor center was an interesting history lesson and the walk to the Cairns was very peaceful. One of the nicest bed and breakfast places I have stayed. Very comfortable accommodation . Home is very clean and tidy and very tastefully decorated in Scottish themes. Breakfast is wonderful - lot's of choice of filling nutritious food. Easy walking to downtown with good selection of restaurants. Off street parking was appreciated. If I could score more than 5/5 I would! The our three person room was spacious and immaculate. The bathroom was exceptional, modern but tasteful. The breakfast was outstanding. Cereals, raspberries, blueberries, juice, croissants, condiments to die for, cheeses, yoghurt PLUS a cooked breakfast! The main part of town was an easy 5 min walk. We enjoyed an early evening walk around town, lots of beautiful buildings and small businesses I would have gone to if we had the time. Had a great stay, very clean and friendly, will recommend. Fantástic, i recomend the B&B. 10 points! Very welcoming host, very clean property in a quiet area, breakfast excellent. 3 of our clients stayed there and they told us that it was great and that they loved it. Thank you for looking after them so well. We reccomend to eat in the local pub in church Street as it has scottish live music in the week end. Great location - central. Perfect that parking available. Great breakfast - just sorry I don't have a bigger appetite! Shower lacked any real pressure but bathroom lovely and clean. Great location for seeing the city. Great bars and restaurants locally. Hire a car and visit Loch Ness and surrounding areas. Only criticism is check-in time. 4pm check in very inconvenient. Inverness is not type of place where you can happily while away a few hours whilst waiting to access your digs. Tried ringing to see if earlier check in was possible but no reply and no message facility. Book in advance for evening meal at weekends as everywhere fully booked. Managed to get table at Little Italy but only had 6pm and this was due to cancellation. Good service and good food. A first class B&B, one of the best we have stayed in. Great friendly b&b with fantastic breakfasts and in a great location for the city center! Lots of great restaurants in Inverness! Beautiful B&B within a short walk to the quaint town of Inverness. Double room was clean & comfortable and the washroom was beautiful. Nice touches throughout the room; chocolates, tea, coffee, and hot chocolate, very nice soaps & shampoos, and the mini-fridge was a bonus. There is a small library where you can borrow books and dvd's as well. Had a rental car so we did a day trip to Loch Ness. The village just past the Clansman boat tours that's worth a stop. Elegant,and clean house. Hostess helpful and kind. Food was good. Would stay again in a minute. The places is very nice, the staff is really kind and helped us in everything. I highly recommend the place. Is it close to the town center, 5 min walk. Very helpful staff. Good choice of breakfast and very tasty. Room is big enough and bathroom is fantastic. The hotel is not in the city centre but you can easily get there with 8 min walk. We had an outstanding stay at Eildon! The staff was very helpful and friendly, breakfasts superb, very clean rooms, and perfect location for our trip. The nearby Castle Tavern just across the street from the castle is a great place to unwind at the end of the day. Short walking distance, it has great views and a laid back atmosphere. Also, two restaurants were top-notch: the nearby tapas place La Tortilla Asesina, and the Turkish restaurant Aspendos. Both are great finds. The nightlife and live traditional Scottish music at Gellions was tons of fun! Touring, don't miss Culloden battlefield and the Clave Cairns. 34/5000 Very clean, could sleep well. This is a very nice B&B with a great location within easy walking distance to the town of Inverness. What a beautiful city! Breakfast was fabulous! Parking is a bit tight and the street is narrow. A great eatery nearby is Cafe 27. Also went to The Kitchen right on the river. Food was great! Absolutely wonderful. We enjoyed our stay very much. Everyone was so nice. The breakfast was great, too. Lovely B&B, with a excellent breakfast and a care taking staff. Rooms were clean and spacious. Nice bathrooms. Recommendation more then desirved. Willing to come back an other time. We really needed to use our Navigation system to find this lovely spot in Inverness. Had a great stay. Walked to dinner at the Castle tavern. Our room was comfortable. Bathroom totally updated. Make a reservation for the Castle Tavern. Good food there and close to the guest house. Clava Cairns was awesome. Perfect in every way! I've stayed here twice and will again. If you have a lot of luggage, call a cab when arriving/leaving. It is a pretty steep uphill walk from the train station. We really enjoyed our stay at this lovely guest house. We have been welcome by Jacqueline a charming lady. The room was big and very cosy with a brand new bathroom ultra clean and plenty of space.Situated in a nice and quiet neighborhood, the city centre was within walking distance with a stunning view of the castle just around the corner. The breakfast was very good and already chosen by us the night before. Inverness is central and you don't need your car to walk around the city. The attractions in the area like Culloden battlefield and Cawdor Castle,among others, are easy to reach and not very far.Castle Tavern is a very good restaurant and charming place just around corner of the guest house, we recommend strongly. This is a really nice guest house. Very clean beautifully presented and very convenient to the city. Jacqueline, the owner, is lovely and breakfast was great. Would recommend Jonnie Foxes for food. The food was great and waiting staff were lovely. Rendezvous Cafe is good for lunch and the waiter is a treat. Eidon Guest House was lovely. We had a large room, compared to other places we had stayed, and it is the only room we stayed in with a refrigerator. We were given snacks of shortbread, chocolates, coffee, tea, hot chocolate and fresh cold milk in the frig. The breakfasts were delicious and served in a beautiful breakfast room. I especially enjoyed the porridge. It was an easy walk into town. The owner, Jacqueline, was warm and friendly, and we really enjoyed our two nights at Eidon Guest House in Inverness. We enjoyed Café One Restaurant, which is just around the corner and down the hill from Eidon House. We spent a lot of time a Culloden, which is 6 miles from Inverness. Excellent all round is the comment I would make for this guest house. Le Mirage in Helmsdale for fish and chips in huge portions. Enjoyed stay very much great location and very friendly helpful staff. Great location for exploring the area. We loved the Kitchen Restaurant. We also loved the Jacobite Loch Ness cruise. Very friendly staff. Very good breakfast. Whisky in The Malt Room. Live music in the Old Market Inn. Jacqueline gave us a warm welcome and showed us to a large and very comfortable room with a huge and very smart ensuite. The guesthouse is on a busy-ish road but it was quiet enough for an excellent night’s sleep. The centre of Inverness is a 5-10 minute walk away (5 minutes downhill getting there, 10 minutes uphill) and the guesthouse is close enough to main routes to be very convenient. Breakfast was very good. The only small gripes were the parking (it was a bit of a tight squeeze at the back although, as with everything, Jacqueline went out of her way to be helpful) and the TV news over breakfast – maybe just a personal thing, but I prefer a gentler start to the day when on holiday! Jacqueline was an excellent hostess and we would certainly come back if visiting Inverness again. Culloden was a fascinating experience. River House restaurant is not cheap but is well worth the cost - a wonderful dinner. It was a wonderful place to stay, the room was great and the owner and staff were totally amazing. It is close enough to restaurants to walk there for dinner. While the road it is on seemed busy when we arrived once inside we heard no noise. This is the best place to stay we just loved it and the breakfasts were delicious. Do the Jacobite cruise on Loch Ness and to the castle ruins it was stunning. Simply a great place to stay in every way. Thank you for making us so welcomed. Beautiful residence, delicious breakfast, great location and the owner is a kind and generous woman. Loved my stay and will rebook whenever I'm in Inverness! The property is conveniently located, the landlady very hospitable and helpful. This property is a very good base to explore Inverness on foot. Very good B&B. The breakfast is very good. Clean, modern rooms. We had a very good stay. Visit the Castle Tavern. Good choice of beer and Whiskey. And a small menu with good meals. Lovely house, spotlessly clean,superb location ( 5 min walk to city centre) and free parking. Friendly staff and fab breakfast, we will definitely return. We loved the house,can't complain,the breakfast where excellent. Sono stata a cena a The Castle Tavern e NON lo consiglio anzi proprio da evitare, mangiato male e personale poco disponibile, cameriera risentita e sgarbata solo perché ancora prima di ordinare avevamo chiesto di metterci in un tavolo appena liberato e più grande di quello in cui eravamo! Très agréable séjour, accueil parfait, merci. We ate at Urquhart's the first night ( very good ! ) and at Mustard Seed the second night ( excellent ) -- we'd recommend either VERY highly. Our wait staff was excellent. This was a great place to stay for two nights. It is an old house but had modern conveniences. It is not the kind of place with lovely antique furniture but it is very comfortable for the weary traveler. The bathroom was so clean it sparkled. The shower had limitless hot water. It even had a hair dryer in the bathroom by a mirror. If you have traveled in Ireland and/or Scotland you will know that hair dryers are rarely in the bathroom. The hosts were very friendly. Breakfast was good. The city center is a short walk away. We very much enjoyed our brief stay and would come back if we are able to visit Inverness again (which we also enjoyed!). We arranged dinner at The Kitchen Brasserie for us and our daughter's family, in part based on your suggestion. The food was great, the view spectacular (upstairs, overlooking the river) and the service/staff terrific. We are very impressed. It's not easy to do dinner for eight, especially when two are younger than 10 years old. A great place to stay, location was good, rooms were clean and tidy. Very clean and well run with a convenient location to downtown Inverness! Ein super schönes, kleines Guesthouse mit sehr freundlichem Personal. Wir haben uns sehr wohl gefühlt und würden jederzeit wieder dort einchecken. Starting with the beautiful house and the dedicated attention of Jacqueline, I can only point out how pleasant the stay the days we were. The breakfast was of excellent standard and very tasteful. The room and bathroom very comfortable and clean. Do not miss visiting Isle of Skye, Loch Ness and every corner of Inverness that you can. It is a magical place and its people make it even more attractive. Very close to walk into town, rooms and bathroom are very clean and modern. Loved our stay! It was a delight staying at Eildon House. Jackie was friendly, warm and welcoming. Nothing was too much trouble and she went out of her way to provide with great information about local things to see and do, as well as, good places to eat. Don't miss the walk alone the River Ness, across the islands and back into town on the other side of the river. The mustard Seed and Cafe 1 are great places to eat. We had a great stay at Eildon Guest House. Our host was helpful and accommodating. Our room was spotless and the breakfast was delicious. We would definitely stay here again! Excellent B&B which was very welcoming. The room and bathroom had been refurbished to a very high standard. The breakfast was also excellent . Very near many bars and good restaurants! Our hostess was wonderful. The accommodations were lovely and quiet. It was also nice having the option of watching movies in the evening as a family after touring and walking all day. If ever back in Inverness, I wouldn't stay anywhere else. Thanks Jaqueline. Number 27 and Hootananny are great pubs for beer and food and it is worth getting the bus to Dorres in order to view Loch Ness from the garden of the local pub! Great place. Made our stay extra special and fun. Our room was really nice, and the bathroom was new and sparkling clean. We really appreciated the shower with the instant hot water. The breakfast room was lovely, and the breakfasts were great. We would definitely stay here again. The location is within walking distance of downtown sights, and there's guest parking. Jacqueline Stevenson, the proprietor, was very helpful, providing dinner and sightseeing recommendations. Lovely place with good food and a stunning bathroom. Great location. Modernized updates. Lovely breakfast room. Great food and service. The owners couldn't have been friendlier or more helpful! We really enjoyed our stay and would stay again. Location was great! Jacqueline was very accommodating and very helpful. Her restaurant recommendations were spot on. Highly recommend the Jacobite tours to Loch Ness. Also, the restaurant Number 27 had great food. (And for a good dinner + a pint, the Castle Tavern can't be beat). This was an excellent place to stay. Close to Inverness Castle and the river but on a quiet street. Highly recommended. great location near to centre with its bars/restaurants but still quiet area. room was spacious with large ensuite and very clean. Bed was comfy .Towels fluffy and changed each day . Breakfast was plentiful and well cooked. It has secure parking off road ideal for motorcycles. Owners helpful and pleasant. No issues at all with this bed and breakfast.Highly recommend this place. As its near to centre there are many restaurants , indian, Italian, Spanish. We visited fort George, great time there and culloden is well worth visit all within 20 min drive. Also in the past we did the loch ness cruise which was also well worth the visit. Can't say enough good things about this B&B! Firstly, the owner was kind enough to let us check in early because we had to catch a bus tour. Room was ready and we didn't have to wait long at all. The room itself was extremely clean, renovated and spacious. Even had a mini fridge which I was really happy about. Building is just a short walk to central Inverness. Also, breakfast was great with many options to choose from! Definitely exceeded my expectations. Would recommend to all! Sehr gutes Guesthouse. Freundlich und zuvorkommend. Die Lage ist gut. Die Zimmer sind gut ausgestattet und das Frühstück schmackhaft und ausreichend. Guter Ausgangspunkt zur Erkundung der Highlands. The owner is great and the place is very well kept up and an amazing breakfast. Highly recommend! Das Eildon Guesthouse hat absolutes Hotelniveau und ist modern eingerichtet mit tollen Badezimmern. Die Betreiberin ist sehr herzlich und serviert ein sehr gutes Frühstück mit reichlich Auswahl. Restaurants - the mustard seed, castle tavern. Fun music - hootanany! Beautifully clean and comfortable room - the bathroom was sparkling white. Nice extras like cool water in the fridge and milk for tea. The owners were very accommodating. Put themselves out for the riders of the Loch Ness Etape which was spot on. Room was great, nice big shower and a comfy bed. Couldn't do much more to make you feel welcome. 10 to 15 mins walk to the city centre, depending on how fast you walk. Plenty to see and a lovely river walk within 5 mins of the B&B. A warm welcome and a great place to stay if you travel through the highlands ! Many thanks Jacqueline ! Definitely one of the nicest and best located B&Bs that we stayed at during our recent trip to Scotland. The location of this B&B is in a beautiful residential area within a short walk to downtown Inverness. Our room was lovely and the bathroom beautiful & modern. Stayed in room 1 with two friends as we were going to Eden court for a show. From the moment Jacqueline greeted us we felt very much welcome. The room had three very high quality beds and linen. Good size ensuite with lovely white fluffy towels. Jacqueline brung us glasses as we had processo and arranged a taxi for us. Nothing was a bother. The fridge with real milk in it was so much better than the usual hotel UHT stuff. Breakfast was delicious. Lots of choice and high quality ingredients. Eildon was immaculately clean and very well maintained throughout. Most definitely would come back here again. Very friendly and helpful. The room was well appointed and comfortable and the en suite shower room was wonderful. The breakfast was very generous and well presented. Many pubs/bars and restaurants within easy walking distance. Everything was great. Top accommodation. Very warm welcome. Jacqueline is a lovely lady and makes you feel at home. Breakfast is all you could wish for. Thoroughly recommend staying. Inverness town centre in easy walking distance. Plenty to do and see. Comfortable bed, well furnished bathroom,and delicious breakfast. And our host was most helpful. We greatly enjoyed the Castle Tavern and the Dores Inn (about 7 miles away). Excellent position for exploring the city, outstanding facilities, gourmet breakfast and a wonderful host. It doesn't get any better than that! Cafe One was an excellent option for a quiet, quality, early bird meal. Our stay was lovely! If im ever coming to inverness again i will certainly stay at Eildon guest house again. We loved staying at Eildon and would stay there again. immaculately clean and well appointed. Friendly and efficient owner. Thank you for a comfortable stay. Lovely hostess who was very considerate and helpful. Even helped defrost our car! One of the best B&Bs I have stayed in. Everything about it was fantastic. 5 minute walk from the town centre. A lovely large room with 2 comfortable single beds, en suite well presented. Tea, coffee facilities in room and small fridge. Warm welcome on arrival and good selection of breakfast options, cereals, fresh fruit, yogurts, brown/white bread, scotch pancakes, croissants and fruit drinks. Then a beautifully cooked breakfast with tea/coffee. Would highly recommend. Maggie. The best Guest House in Inverness. Really family-friendly with lovely staff. We definitely going to back as soon as we can. Thank you again for everything! Jacqueline was a welcoming host. Room was very comfortable, clean, and quiet. We slept well. Breakfast was extensive and filling with lots of options. In town: Hootenay's; Guillion's Pub; museum (free); nice walks; pretty town. Out of town: Battle site of Culloden; Orde Whisky Distillery Tour; Loch Ness; Fort George Trains and buses are the way to go - excellent service. The guest house is very nice and the innkeeper is great and very friendly. We were very pleased with our entire experience. We would be happy to stay there again. Breakfast was excellent. The staff was very pleasant and helpful. A warm welcome, very tasteful furnished and spotless rooms. Breakfast left no wishes open. My recommendation! Super clean very friendly and breakfast was fantastic. The Castle Pub is walking distance from Eildon House. The food, service and atmosphere are wonderful. They have an outdoor patio/deck with a view of the Inverness Castle. Very nice and cozy house. Very nice staff. Each room has DVD and the kid watched the movie:). Worth the price. Thanks for the host. If you want to try the good Scottish food, please book ahead, otherwise the restaurants are fully occupied. The location is 5 minutes from restaurants and the center of Inverness. This was the best B&B we stayed in while visiting Scotland. The host is very friendly and the beds were comfortable. The bathroom was up to date and clean, plus we didn't have to leave our room to get to it. Downtown was a surprisingly short walk. The Kitchen was a great place to eat. And there is a nice chocolate/coffee shop right as you get into the Downtown area. Beautiful house within walking distance of city centre. Comfortable room, with good facilities. A great place to stay. Very clean and well organized. Breakfast also very good. Loved the location, loved our room, loved the yummy breakfasts. Everyone was really nice! Local restaurants are right around the corner. Would recommend Cafe 1. Did a great Loch Ness tour. Loved walking around the River Ness. Very friendly and very good Service. Downtown starts around the corner. Excelent. Super guest house, spotlessly clean with friendly and helpful staff. Excellent breakfast. Beautiful property. Friendly and helpful staff. Excellent breakfasts. Could have used an earlier check in time. Room was a little small for three adults but that was our choice. WiFi didn't work very well. Great location great staff clean. We would stay again! Excellent, we stayed very well! Inverness is a beautiful place as well as its surrounded. Great restaurant "The Castle Tavern" near the castle suggested by Eildon Guest House. Clean and cozy place. Super nice breakfast. Five minutes walk to city center. We had a very pleasant stay with you. Your breakfast was amazing. We didn't have to eat another thing until our evening meal, thank you. The cleanliness of your rooms and the nice little touches of the shortbread was so lovely and homely. Loch Ness is a must to see.We enjoyed the local Pubs and Restaurants, Georges Thai and Indian Restaurant was very good. We also visited Culloden Moor, we found it very interesting. Thank you for the wonderful breakfast! If you stay in a weekend, then book a table in one of the restaurants, because most of them are booked. Traveled up from London over a period of ten days return staying at six locations during our trip. The Eildon was by far the best residence we stayed in. If you are lucky enough to find a vacancy at this Guest House book it you will not be disappointed with any aspect of your stay. Very friendly and helpful, great breakfast, we had a 3 bed room and absolutely no complaints. Highly recommended. Excellent customer service. We reached the hotel much before its designated check-in time but, they accommodated us immediately without any fuss. The place is quite homely with excellent breakfast. My daughter loves to read and made good use of the book collection. fantastic place where even the smallest detail is taking into consideration. Great room, elegant but practical and very comfortable. Jackeline the owner is very polite and on top of everything. An enjoyable stay in beautiful Inverness. Lovely guest house with friendly helpful staff. The Guest House was nicely located within walking distance of downtown. The staff was friendly and helpful. Breakfasts were very generous with many choices. We are at a local pub called Johnny Foxes by the river. Tasty food. Nice atmosphere. We spent two nights there and used our daytime hours to travel by car to various nearby sites. We had a lovely stay at Eildon Guest House. Jaqueline (the proprietor) and her team were always very friendly and had good recommendations for places to visit and to eat. Also the breakfast offered everything for everybody. I would go again to Eildon Guest House! We enjoyed a wonderful visit, thank you so much! Very clean. Tastefully decorated, excellent breakfast and the owner couldn't do enough for us. Would definitely go back. wonderful, friendly welcome and delicious breakfast. would definitely recommend Eildon Guest House to anyone staying in Inverness. Scores above say it all.Breakfast with choice - excellent.Friendly host and there is no doubt we would stay again. This is a really lovely place to stay! Jaqueline is warm and welcoming and has thoughtful little touches all over the house. From the bowl of toffees next to the guest book, a wall of books and DVDs to use, chocolates by the bed and a wonderful breakfast, it all says welcome. Our room had a spotlessly clean, large bath with a skylight and great shower. The bed was very comfy with beautiful soft linens. The location is wonderful. Close to town but very quiet.I am hoping to come back soon and highly recommend The Eildon Guest House. My daughter and I didn't have a lot of time in Inverness but it is a very pretty, friendly place. We took a one day whirlwind tour to the Orkneys Islands from here and it was fantastic! Well worth the time as you see beautiful countryside, have 2 ferry rides and see amazing 5,000 year old dwellings and standing stones. Big twin room. Big en suite with nice shower. Friendly welcome from Jacqueline. Easy walk to restaurants and town center. Free WiFi. Free parking onsite was a wee tight. Dinner at Castle Tavern. Good fish & chips but the fish was huge and too much for small appetite. See Inverness Castle. Great location.Very good tips on what to do and where to go for food and fun. Great breakfasts. Get out and see the countyside. Experience publife and the traditional music. Lovely clean,modern and quiet guest house in a great location. Landlady was very helpful and went the extra mile for us when we needed help with a puncture repair on a bank holiday. We were on motorcycles and were welcomed without a problem. Large room so great for bikers with lots of gear. Could not be any better. If you are looking for easy access to the best roads in Scotland for a bike, Inverness is the place to stay. Eildon guest house was superb for bikers needs. Lovely guest house. Great breakfast. Would use it again if in the area. Adorei o atendimento , a organização e limpeza!! Jacqueline is awesome and went out of her way to make sure we had everything we needed. Breakfasts were so good. We appreciated the good, hot coffee. Cafe 1 is a good restaurant and close to Eildon Guest House. We went on the Jacobite Sensation tour which takes you on a little bus excursion, then for a cruise on Loch Ness which was narrated and very interesting. The cruise then takes you to Urquhart Castle where you spend an hour on your own but there are guides there if you want a tour. You get back on the bus and go to a Loch Ness Museum which was kind of dumb but fun nonetheless. There's also a little Inverness bus tour included. Cafe1 restaurant was excellent. Walk up river seemed like you were in the wilderness but you were only short distance from town center. we enjoyed our stay, the location is excellent with on site parking and the guest house was very clean with a warm welcome. Nosotros estuvimos dando un paseo por los alrededores del castillo, el Rio Ness, Victoria Market... Almorzamos en un KFC que hay en un Shopping center y para cenar, lo hicimos en Jonnhy Foxers (un ambiente estupendo), junto al río. warm and Professional welcome. Facilities are complete, rafinated. Quality of bed is top. Breakfast is delicious and abundant. We will come back with a great pleasure. Great location, walkable. Lovely old manse beautifully maintained. Room ample. River walk between pedestrian bridges, live folk music at Hootenannies. Perfect location for Town Centre - with free parking. My first stay here and received a warm and friendly welcome from Jacqueline, the owner. Very comfortable room with lots of facilities - including free wifi - and even a fridge! Great breakfast. Will definitely be back! Beautiful place. Great sleep. Very comfortable place to stay. Very beautiful place. Jacqueline is so nice with her guests! We are near the City Center and the Scottish Breakfast was the best we eat in Scotland! Your guesthouse is very nice and beautiful, and situated in a very beautiful residential area. The room was very spacious. Plenty of information on Inverness and Scotland provided. Lot of books, unfortunately we had no time to read! And many thanks for helping us to find a fuel station. The guesthouse is located about 10-15 minutes walk from the railway station. Coming from railway station station, you might prefer to take a taxi as it is uphill. The way back is easier! We had a very tasty late Sunday lunch at the gastro pub Number 27 at the Castle Street nearby. Lovely guesthouse, Jacqueline was so helpful & welcoming. Triple room was perfect size & well equipped. Will definitely come back for my next trip to Inverness. We enjoyed our stay at the Eildon Guesthouse. It is a short walk to the pedestrian mall and river in Inverness. We had a good meal at a fair price at the Castle pub. Very good and a lovely lady looking after us as well - what more do you need! 2 restaurants with "Castle" in their names and in the same street in Inverness! The one directly opposite the Castle was busy, good food and good service and very good value! Lovely B&B. Friendly staff and beautifully presented. Really nice house! The brakfast was great! The room was very beautiful! Highly recommended bed and breakfast, close to city centre. Tastefully decorated, a warm welcome but more important a very comfortable bed. We needed an earlier than normal breakfast and immediately we were delighted to hear this was not a problem. If you love Indian food a trip to the Rajah restaurant is a must it is delicious. Very clean and tidy. Jacqueline was more than accommodating for us. Jacqueline recommended "The White House" which was very nice and we highly recommend. Very clean and comfortable bed and breakfast. Very welcoming, nice and friendly. Good location to city centre. Great attention to detail and great breakfast. Castle Hotel serves lovely meals at a reasonable price. Dining places hard to find at winter closing early. Extremely friendly welcome and very relaxing stay. Breakfast was excellent and would especially recommend the porridge. Great base for countless day trips e.g. Loch Ness, Glen Affric, etc. Very welcoming, lovely rooms, highly maintained property. Breakfast was excellent with plenty choice and freshly cooked. Location is ideal. Would definitely return and recommend this for a stay in Inverness. Great location in a beautiful house with private parking. Nice breakfast cooked to order and selection of cereals, yogurts etc. Owner, Jacqueline is a great host. Provided restaurant recommendations, driving directions and general information. Rooms have DVD players and docking station. Rooms are small. For advice on restaurants and sites, ask Jacqueline! Excellent Guest House on a quiet street in a nice neighborhood. It is within walking distance from the city center, bus,train station, shopping center, and restaurants. The room was comfortable, clean, and very quiet for sleeping. We had a wonderful breakfast cooked at our requested time. I would definitely recommend this guest house. Stunning place, beautifully appointed and equipped. Breakfast lovely too. Really, can't say anything wrong about this place. Wow! We wish we could've stayed longer. After touring Ireland and U.K for a few weeks I can say your B and B was one of the best! Thank you! Clean, inviting, great breakfast, amenities and a kind host! Easy walk into town for a look around and a friendly pub just down the hill for dinner...perfect! Lovely place to stay. Very clean. Friendly and helpful staff and a great breakfast. Very close to town centre. Would definitely recommend staying here and will definitely be looking to stay here again in the future. We were very pleased with our room and with the lovely breakfast dining room. The convenience to the city was excellent, and we would recommend your home to others. Very nice and friendly B&B. The only thing to comment was the strong smell of soap or spray in the rooms. Being an asthmatic, it was a bit too much for me, especially in the sleeping room. The wireless network was a bit slow. Except from this; excellent! Very friendly, great situation and beautiful house. Breakfast was great. Really enjoyed our stay, attention to detail is great, friendly staff, rooms are comfortable and spotless, great location just 10 minutes walk to centre of Inverness. I recommend you have the porridge it is the best. It was a very nice place to stay! nett und freundlich, umfangreiches Frühstück, sehr gutes und schnelles WLAN, schön zentral, aber doch ruhig gelegen. A very pleasant stay in a nice guest house. The facilities were great and the dvd library was a nice touch. Staff were really friendly too. My only slight niggle would be that it would be good to have proper bathmat, but other than that, lovely. My daughter and I appreciated having DVDs to watch. The breakfast room was lovely. It was hard for me, though, to keep a constant warm temperature in the shower. We really enjoyed our "Highlands Experience" coach tour and walking along the River Ness. Eildon Guest House is a friendly and well kept B&B. The rooms and service were great and the place was peaceful enough despite the closeness of Inverness down town. Inverness castle is within a two minute walk and so is the city centre. There are many good restaurants just down the hill from the B&B. This is a perfect place to stay in Inverness. Delightful stay. Very helpful and friendly, especially storing our bikes. Delicious breakfast. Well placed for excellent restaurants, too. Thank you! Friendly and welcoming. Very clean and rooms very well equiped. En suit shower, fridge, flat screen tv, radio, comfy beds, towels, even an ironong board. Would recommend to all , will be going back. Would recommend fried breakie full works, brilliant. Off road parking a bonus. Try eating at The Mustard Seed for great steaks or The White House, all in walking distance, 10 mins of guest house. Take a walk alomg river Ness in evening, romantic and quiet. Jackie and her staff are friendly and very helpful. A short, 3 block walk to the castle, shopping and restaurants. Lovely, clean, and beautiful stay. Highly recommended! Perfect location only few minutes walk to restaurants. Very service minded and friendly atmosphere. Really good breakfast. Location well situated to make daily tours to Loch Ness,Cairngorms,Glen Affric for instance. Many restuarants for all tastes. Jackeline received us as if we were family, all the attention you can imagine. The room was lovely decorated and the whole house was extremely clean. There was one shelf full of books and other one full of dvds, so you can pick one of those if you wanted to rest in your room. What can I say about breakfast, delicious!!! Coffee, tea, juice, tradicional english breakfast and more. Im sure I would come back to this lovely place if i ever returned to scotland! Thank u Jackie!!! Room was beautiful, beds were very comfy, bathroom was spacious. Some parts of breakfast were better than others, but overall quite enjoyable. We had no problems with our accommodation here, everything was very good. The room was pleasant, the beds comfortable and the bathroom was modern. The owner made us feel welcome. I would certainly be happy to recomment this guest house. Very near centre of town, shops, restaurants, pubs etc There is a short hill climb to reach the premises. Lovely stay - clean, comfortable room and very friendly, accomodating staff. We'll definitely be back when in Inverness! The Gellions pub was brilliant! A beautiful guest house located a short walk from the center of Inverness. El hotel está muy bien situado y el personal es muy amable. El baño es demasiado pequeño. El desayuno lo puedes encargar a tu gusto (te ofrecen los componentes del típico desayuno escocés) y te tienen preparado a la hora que lo pides. Lo único malo es que la habitación es demasiado pequeña para pasar 3 días. Beautiful accommodations, friendly staff and delicious breakfast. I would highly recommend it. A boutique B&B! Excellent location. Great decor, spacious, very clean, perfectly maintained! Excellent hot breakfast served in a very pleasant dining area with literally no waiting! Great staff! Great facilities, especially the DVD player and the I-phone dock and great collection of DVDs and books! Must do the Loch Ness cruise. Plenty of trails to trek. Good Pubs. Great walk by the river! Very comfortable and the lady was very helpful. We 'd recommend it to anyone. Everyone one was friendly and approachable. No identifiable improvements required. The breakfast was very good, with the blackpudding being cooked to perfection!!. Not often that happens! Facilities very good, and on site parking (or availability of street beside the property) is good in a town location. A great place to stay. Jacqueline the proprietor was extremely helpful in booking an evening meal in town. As we only booked that day, we expected to get the last room in the place which might not be the best, but how wrong we were, all the rooms are lovely and we stayed in one of the front ones with everything needed. We would definitely stay here again and recommend to friends, a real example of how professional hospitality should be delivered. Riva Italian restaurant by the bridge was lovely. Everything was perfect except a bit cold in the morning. Wifi was quite weak in our room. An easy walk to downtown. Good place to stay. Very nice place - good food, location and price. The oatmeal was the best I have ever had- so creamy and delicious! Jacqueline was very nice and helpful with suggestions and directions. Be sure to go to The Gellions for the live Scottish music and dancing. we had a great time there. A visit to the Tomatin Distillery was very interesting. Comfortable, stylish and clean. Friendly atmosphere, easy walking distance to city centre and the river Ness. Have now stayed here on numerous occasions and will undoubtedly book again, should we be up in Inverness. Great walks, easy walking distances to lots of eating places and shops. Aquadome nearby has great swimming facilities for leisure or serious swimming. Kids love the wave machine. Lovely b&b, wonderful hosts, great breakfast. All around we had an excellent stay! Very nice and comfortable atmosphere. The breakfasts were lovely and my daughter and I enjoyed the self-service toast and pancakes. They gave us the lovely table in front of the window and the bacon, eggs and porridge was wonderful. Inverness castle is just down the road, with good views across the river. Castle Tavern served a lovely meal, just across the road from the castle. Most comfortable beds of the entire trip! Thanks for your hospitality! Thoroughly enjoyed our stay and the great breakfast provided. Only suggestion is to move up the check-in time or check-out time. All other places we stayed were check-in at 2 and check out at noon - the 4pm/10am times were a bit tight. My sister and I just stayed for 1 night. Inverness wasn't our favorite town, but we loved our B&B. If someone was staying for a while, it would be quite comfortable. We had room 2 which has 2 twin beds. The room is very nice. There is a lot of storage, there is a fridge and ironing board in the room. The bathroom was spacious. There were multiple rooms and the outlets were in excellent location for flat ironing hair. Plus there were outlets close to the beds so I could have my phone charging near me at night. The UK doesn't allow outlets in the bathrooms so the placement of outlets in the bedrooms near a mirror is important. This B&B had the outlet locations in just the right spots. It is in a good location for walking to town. Breakfast was good. Fantastic Guest House b&b, very well located, room very clean and confortable. Very nice staff. Great, clean and appears to have been recently renovated. Only issue for me was the low power hairdryer, which really was a minor inconvenience. From Jacqueline's greeting on day one to the morning we departed, our stay at the Eildon was comfortable. Jackie is a gracious hostess, managing a large number of guests during our 6-night stay. She made sumptuous Scottish breakfasts. Our room had plenty of storage, TV, and free wi-fi, and was tidied and replenished with tea/coffee/milk every day. We would return here, for sure. The Eildon is a 15-minute walk from bus and train. It's minutes from the River Ness, Craig Padraig city park, Botanic Garden, and Caledonian Canal. We bought a 7-day 4-zone bus pass with Megarider (from bus driver) to ride to Highland Walks and Dunrobin Castle in Golspie. A Tesco grocery is across R. Ness at Bridge Street. Of the city's many restaurants and pubs, we partook of Wetherspoon, called the King's Highway. Inverness has a lovely city setting on Moray Firth. Clean tidy, well furnished. lots of nice extras such as tissues etc.Lovely breakfast. nice friendly landlady. only small complaint - was unable to connect my I-pad (and the parking wasn't convenient. Lovely B&B with a great location.Staff very friendly. room spotless and breakfast very enjoyable. Would recommend this very highly to everyone. Would recommend the Castle Tavern. Friendly staff and good food. Best ever steak pie I have ever had. Hopefully we can return to the highlands soon. When we do we plan on staying here again. Lovely B&B!! Delightful stay in lovely surroundings. This was the loveliest little house to stay at. Quick walk up the hill from the main streets and the river. Wonderful rooms that were clean and cozy. Also Jacqueline was a welcoming hostess. She also makes a phenomenal breakfast. Staying here definitely added a great experience to our trip. I hope to come back someday. Find sticky toffee pudding! It's brilliant. And the boat tours are quite a good value to see the city/countryside/Loch Ness/and castles. The visitors center on high street is the best place to go to get all the info you could want to choose your adventure. Very good place to stay if you go to Inverness. What a find!! Welcoming, warm, friendly and so handy for the town centre and surrounding sites. I will definitely stay here again next time I'm in Inverness. Would recommend without hesitation.